How low can the Lunatic Left go to allow, accept and advance Anti-Free Speech? If the gang of punks at a Trump San Jose rally in California is an indication, the bottom has a long way to go. Decorum is essential when intelligent protest is the objective. However, when the intent is to disrupt or assault and silence supporters of an anti-establishment GOP nominee, a simple question needs to be asked. Who are these organized goons working for? Once upon a time, the UC Berkeley’s Free Speech Movement “demanded their right to free speech and academic freedom”. Guess the hoodlums never took a class on Free Speech. Their entire purpose is to stamp out any advocacy that does not conform to their twisted and perverse vision for a sanctuary city state of demented outsiders, who want to destroy any semblance of free markets and capitalist economics. For those with direct experience or students of the 1960’s the street demonstrations and protests where fundamentally over policy, the Viet Nam War in particular. When youth burned their draft cards or the American flag the motivation was to stop a foreign policy that was designed to fail. Contrast this fact with the deplorable enthusiasm to replace Old Glory with a Mexican banner. It should be self-evident that the riot that engulfed the streets of San Jose had no intention of engaging in constructive debate. This organized mob of anarchy has all the elements of a travelling show of budding terrorists. Only a fool would defend their tactics and methods. Yet, the IDIOT MAYOR of San Jose Sam Liccardo Blames Trump for Thug Anti-Trump Rioters. 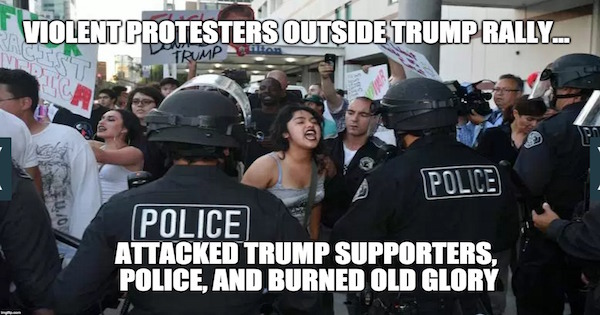 “Yesterday in San Jose swarms of Anti-Trump rioters violently attacked peaceful Trump supporters, waved Mexican flags, burned Trump hats, flags, and showed off Mexican gang signs. This, according to the idiot mayor of San Jose, Sam Liccardo is somehow Donald Trump’s fault. Well Sam, the outcome of the “dangerous and explosive situation” is the nature of the thug rioters have been captured in photos and videos. In order to appreciate the total morally bankrupt condition that has plunged the Democrat establishment into, compare real leadership with the bedlam promotion from Liccardo. The principled Senator from Minnesota, Eugene Joseph McCarthy a Man of Courage, spoke on the disgrace from the 1968 Democratic Convention. If Mayor Liccardo, a Hillary supporter can boast that the violent muggers are victims of Trump’s outrageous words, it is a very short step to offer police protection for the La Raza outlaws and boosters, who want to make California into a third world “Venezuelan” ghetto. While Mayor Daley turned loose his storm troopers on the anti-Viet Nam protectors to cap any free speech assemblage, today’s Democratic establishment officials want to dispel any opposition to the Clinton clan of careerist criminals, from any quarter. I wanted to congratulate you and your police department in San Jose for being a national disgrace in allowing massive full fledged criminal mayhem to be visited upon Americans attending a Donald Trump rally in your city. Hillary Clinton (Queen Jezebel), her husband (King Ahaz), George Soros, Haim Saban, Jeffrey Epstein, Wall Street, the Central Bankers and Globalist Free Traders, and the War Party’s defense contractors, not to mention William Kristol of The Weekly Standard, all salute you today. And don’t worry. If Queen Jezebel is elected, Americans won’t notice her family bank account courtesy of foreign interests, her ongoing support for a domestic police state, the deliberate exportation of American jobs and manufacturing abroad, or the subversion and mass murder she’s helped accomplish in Libya, Syria, Iraq, Palestine, Ukraine, the Donbass, or even what is coming after 2016 in future needless tragedies with Iran, Putin’s Russia, or China. This conclusion is central to the topic of enshrining the effective ability to maintain a free speech society. An in-depth investigation into Trump under attack by 187 organizations directly funded by George Soros, can be found on this resource site. “Some of these groups have actively opposed Donald Trump for president and may be part of the recent levels of violence and chaos seen at his rallies. Many of the groups favor: open borders, amnesty, giving illegals voting rights, Muslim migration and social justice. Since this overwhelming evidence of intentional subterfuge comes from the usual suspects, the most needed inquiry must ask, who benefits from this electoral anarchy? Soros represents the interests of the globalist order. He wants Hillary Clinton in the oval office. If all these anti-free speech desperado groups were bona fide protestors, why are they not interrupting the gatherings of the presumptive Democratic nominee? The obvious question is will the street thugs that caused the cancellation of the Chicago rally be in force at the Republican convention in Cleveland? However, the ultimate acid test will be to observe just how many ruffians will make the trek to Philadelphia for the Democratic National Convention? The Sanders delegates are being treated with disrespect, not because as Will Rogers would say: “I am not a member of any organized political party. I am a Democrat”, but because most oppose many of the establishment policies. In the end game, the bipartisan duopoly wants another Clinton presidency. Using brute force as cultural hooligans apply their skills of intimidation and rioting is all part of the master plan to bury an America First renaissance. With the distorted main stream media coverage and the disparity in the use of meaningful language practiced by Sam Liccardo, the Orwellian public officials that serve the masters of Totalitarian Collectivism encourage the legions of Soros groupies to accelerate the demise of the Republic. Woefully the right to peaceful assembly has forfeited any authentic status when paid troublemakers are used to frighten and threaten opposition to the established order. The application of California values is plastered all over the Democratic Party elite. Even residents of the golden state know that the New York values of Trump do not condone the designed disruption of political speech. Such a lesson is one more reason Sanders supporters need to condemn Clinton and her globalist cohorts.